Easy Solution to Convert and Rip DVD to QuickTime. Some video fans might want to play DVD movies on their QuickTime Player. However, they need to convert DVDs to QuickTime video format first. Before discussing how to convert DVD to QuickTime, we'd like to introduce what QuickTime is since some users might not know it well. QuickTime is a cross-platform multimedia architecture developed by Apple Inc., including QuickTime Player, QuickTime Pro, QuickTime Streaming Server and QuickTime Broadcaster. Available for Windows and Mac OS, it is used to handle digital video, audio, animation, text, and image formats. You can import video files like MOV, QT, MPEG-4, H.264, 3GP, MP3, AA, etc to QuickTime Player. And among these video formats, MOV is the most commonly used one. As mentioned above, QuickTime Player can't play DVD formatted files. Commercial DVDs are encrypted and only special DVD player software can open and display them. It's a pity that even your own (not encrypted) DVDs couldn't be played by QuickTime Player, either. As a QuickTime user, it's reasonable to watch your own DVD movies (you bought or made by yourself) with QuickTime Player. WinX DVD Ripper - NO. 1 fast and safe DVD to QuickTime ripper Rip DVDs to QuickTime MP4/MOV for free. Also capable of ripping DVD to H.264, HEVC, MKV, AVI, WMV, iPhone (XS), iPad, Andriod, etc. at ultrafast speed with Nvidia/Intel/AMD hardware acceleration. WinX Free DVD Ripper is a free software program that facilitates ripping the content of any DVDs (encrypted or not encrypted) to QuickTime MOV video format in several clicks. Converting speed is fast and the video & audio quality is great. This following text will take this program for example to introduce the steps to convert and rip DVD to QuickTime MOV video format. (We mainly talk about MOV for it is the most popular QuickTime format). Please download the DVD to Quicktime on Mac or PC (100% free and clean). Run WinX Free DVD Ripper, you can click "Disc" button to import DVD from DVD drive or click "Folder" button to import DVD content from your DVD folder (that contains VIDEO_TS) on your PC. Click "to MOV" button, then the DVD movie will be converted to MOV video file that can be played by QuickTime Player. Click "Browse" to select the destination folder to save the MOV video converted from DVD on your computer. Click "Start" button to start conversion and you can view the process. 1. WinX DVD Ripper can not only convert DVD to MOV file, but also rip DVD to MP4, WMV, MPEG1/2, MP3 file, etc. 2. It's quite easy to remove the DVD subtitle as you wish by clicking "Subtitle" and choose "Disable". 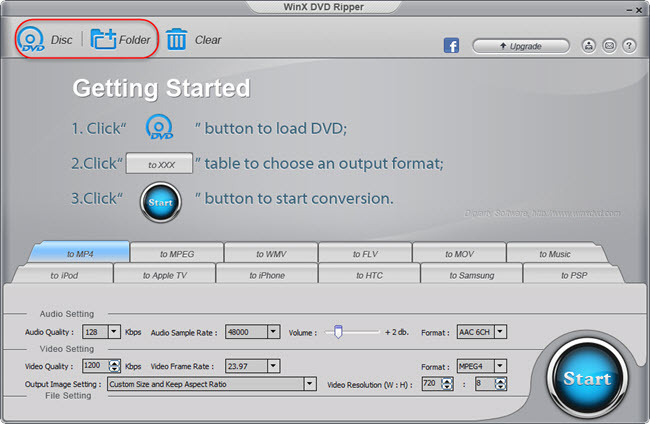 Instead of converting DVD to MOV video file, you can also choose to rip DVD to QuickTime or iTunes video directly, with the help of WinX DVD Ripper for Mac. Convert DVD Disc to Digital Copy Files as MP4, H.264, HEVC, etc. DVD disc to digital copy guide: learn how to convert DVD disc to digital file as MP4, AVI, MPEG, H.264, HEVC, MOV, ISO, etc. on Windows 10/8/7 and Mac, convert Disney DVD disc to digital videos with best DVD/disc to digital converter. The top best 3 DVD rippers for disc to digital conversion on Windows 10, 8, 7 (32 & 64 bit), Mac, Linux, etc. 2018 top 3 DVD ripper to rip DVD movie to MP4, H.265, AVI, MOV, iPhone XS/8, Android, etc. on Windows or macOS Mojave. Part 1Best Tool to Convert DVD to QuickTime? Convert DVD Disc to Digital Copy Files as MP4, MKV, H.264, HEVC, etc.